Are you s relative (grandparent, aunt/uncle, sibling) caring for a relative child? As a relative caring for a family member's child we'd like to learn what it's been like for you? What challenges do you have and where do you turn for help? What other support would be helpful? Oregon is getting ready to implement a new federally-funded "Kinship Navigator" Program sometime next year. We need your information to help design the program so that it fits the needs of folks in rural areas, not just the big cities. This is for Jackson and Josephine Counties! 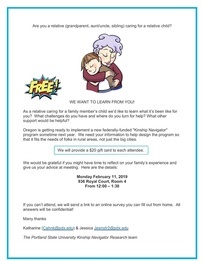 If you are unable to attend, we can send you a link to an online survey you can fill out at home. All answers will be confidential.